Documents relating to the school massacre, released after a 100-year secrecy rule was lifted, show how police investigated claims of a Masonic conspiracy. Among the 3,000 letters and reports uncovered is correspondence between a member of public and Lord Cullen's office regarding suggestions that the gunman, Thomas Hamilton, and senior police, who were aware of concerns over summer camps and clubs he ran, were Masons. The letter, dated 11 April 1996 - less than a month after Hamilton killed 16 pupils and a teacher at Dunblane Primary School - said: "It is in the public interest that Lord Cullen be asked if he is a Freemason, given the widely held view by the public that Thomas Hamilton's Masonic affiliation was probably the reason that the Ombudsman overturned an earlier decision by Central Regional Council in 1983 to prevent Hamilton from running youth clubs, and that his Masonic affiliation probably facilitated his application for a gun licence." The letter went on: "It is far too important to allow the Masonic implication to be whitewashed by furtive operations in the Freemasons, intent only in 'diverting the discourse' - a Masonic ruse - from the involvement of Freemasons and Freemasonry." Hamilton wrote scores of letters to police, council officials, MPs and even the Queen, claiming he had been the victim of a grand conspiracy to prevent him running boys' clubs. Lord Cullen Masonic Denial. Cullen Inquiry. Billy Burns. Lord Cullen Masonic Denial. Cullen Inquiry. Billy Burns. Lord Cullen Masonic Denial. Cullen Inquiry. Billy Burns. Lord Cullen Masonic Denial. 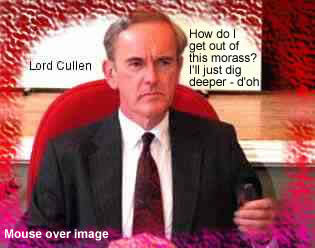 Cullen Inquiry. Billy Burns. Lord Cullen Masonic Denial. Cullen Inquiry. Billy Burns. Lord Cullen Masonic Denial. Cullen Inquiry. Billy Burns. Lord Cullen Masonic Denial. Cullen Inquiry. Billy Burns. Lord Cullen Masonic Denial. Cullen Inquiry. Billy Burns. Lord Cullen Masonic Denial. Cullen Inquiry. Billy Burns. Lord Cullen Masonic Denial. Cullen Inquiry. Billy Burns. Lord Cullen Masonic Denial. Cullen Inquiry. Billy Burns. Lord Cullen Masonic Denial. Cullen Inquiry. Billy Burns. Lord Cullen Masonic Denial. Cullen Inquiry. Billy Burns. Lord Cullen Masonic Denial. Cullen Inquiry. Billy Burns. Lord Cullen Masonic Denial. Cullen Inquiry. Billy Burns. Lord Cullen Masonic Denial. Cullen Inquiry. Billy Burns. Lord Cullen Masonic Denial. Cullen Inquiry. Billy Burns. Lord Cullen Masonic Denial. Cullen Inquiry. Billy Burns. Lord Cullen Masonic Denial. Cullen Inquiry. Billy Burns. Lord Cullen Masonic Denial. Cullen Inquiry. Billy Burns. Lord Cullen Masonic Denial. Cullen Inquiry. Billy Burns. Lord Cullen Masonic Denial. Cullen Inquiry. Billy Burns. Lord Cullen Masonic Denial. Cullen Inquiry. Billy Burns. Lord Cullen Masonic Denial. Cullen Inquiry. Billy Burns. Lord Cullen Masonic Denial. Cullen Inquiry. Billy Burns. Lord Cullen Masonic Denial. Cullen Inquiry. Billy Burns. Lord Cullen Masonic Denial. Cullen Inquiry. Billy Burns. Lord Cullen Masonic Denial. Cullen Inquiry. Billy Burns. Lord Cullen Masonic Denial. Cullen Inquiry. Billy Burns. Lord Cullen Masonic Denial. Cullen Inquiry. Billy Burns. Lord Cullen Masonic Denial. Cullen Inquiry. Billy Burns. Lord Cullen Masonic Denial. Cullen Inquiry. Billy Burns. Lord Cullen Masonic Denial. Cullen Inquiry. Billy Burns. Lord Cullen Masonic Denial. Cullen Inquiry. Billy Burns. Lord Cullen Masonic Denial. Cullen Inquiry. Billy Burns. Lord Cullen Masonic Denial. Cullen Inquiry. Billy Burns. Lord Cullen Masonic Denial. Cullen Inquiry. Billy Burns. Lord Cullen Masonic Denial. Cullen Inquiry. Billy Burns. Lord Cullen Masonic Denial. Cullen Inquiry. Billy Burns. Lord Cullen Masonic Denial. Cullen Inquiry. Billy Burns.